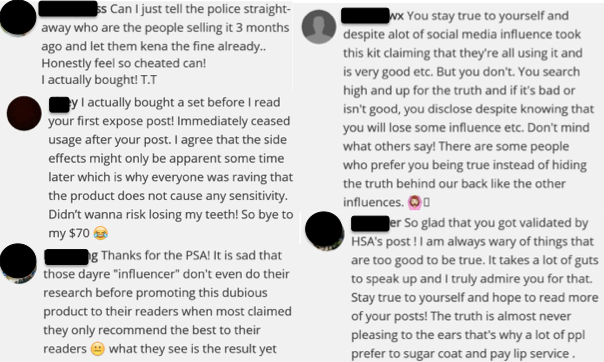 The Beautiful Teeth Whitening Kit, which was popularised by various social media influencers and sold like hotcakes earlier in the year, has now been confirmed to be potentially harmful by the Health Sciences Authority (HSA), who has now banned sales of it to the direct public. 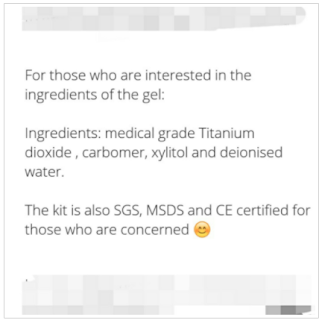 Social media was littered with popular influencers promoting the kit to their followers, with plenty of before-after photos that looked rather promising. Curious to know how they managed to amass so many photos? Well, they made buyers take photo to serve as a "1 month guarantee" for any faulty parts, that's how. On 20 July, I decided I had enough of the irresponsible marketing and promotional antics surrounding the much-hyped kit, and decided to verify whether it really was as good as many influencers were claiming. 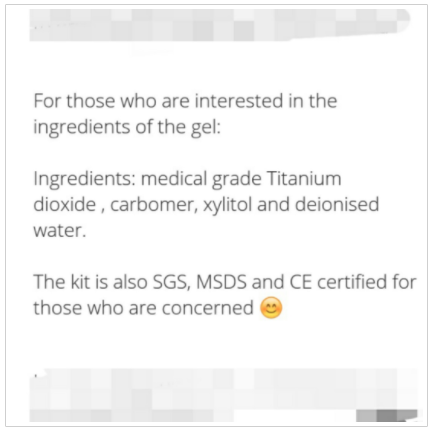 I warned about how the kit was not approved by HSA (contrary to what the distributors were claiming), was potentially damaging to your teeth and health if accidentally swallowed. The so-called certifications they claimed were also questionable (I verified that it wasn't true). Screenshot from an influencer who was promoting the kit. 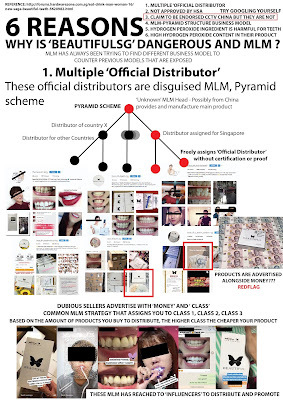 I also pointed out how it looked suspiciously like a MLM pyramid scheme (see also: How to spot a MLM scheme) and that what many of the distributors / influencers were telling people to be careful of fakes because only the $70 version was the "official, authorized" kit. But elsewhere, someone who got recruited revealed that her commission was $50 (while a reader of mine pointed out that the kit was available on Taobao for just $20. You do the math.) To recruit folks into selling for them, some of the original distributors were posing with lots of cash with the message "Want to earn? Come be a distributor!" You can read my original exposé here. In other words, that's $15,000 in commissions for sale of a product that HSA has now denounced as potentially corrosive and which are not allowed for sale directly to the public. Another was boasting about how she earned $20,000 within a single month. Is this new wave of influencer marketing the new MLM? The funny thing is, it remains to be seen whether the social media influencers who profited from selling this product to their followers will be held to accountability, or even fined. A little birdie tells me this is highly unlikely, and it won't be long before we see history repeat itself. But next time, it might not be in the form of a teeth whitening kit.